CEX.IO Review 2017: CEX.IO is the first Bitcoins platform to appear in the market. It was first introduced in London as Bitcoins exchange and cloud mining provider. Before you buy the Bitcoins you need to verify with your identify before you buy the Bitcoins through the exchange offer. 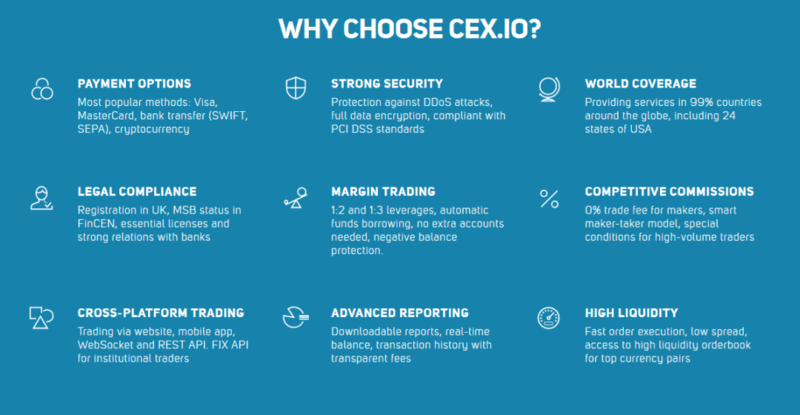 CEX.IO you can these Bitcoins through credit cards as well , there will be a wire transfer or a SEPA transfer, moreover CEX.IO transactions work a bit different than other Bitcoins exchange, they are based on two things either they fill or kill the orders. The orders will be executed and immediately and in full, so this means that for way you have agreed t pay or to get that’s that exactly will happen. The working of this Bitcoins is quite different than the other Bitcoins were you will encounter liquidity issues. How it works is, actually its very simple to use you have to enter a trade CEX.IO that calculates the prize and freezes it for 120 seconds, the input the amount of money that you wish you the spend and the same you will see the amount of Bitcoins you can receive, after this you need to press on the buy or sell button, then system check o verify that do you have enough funds or not. If the situation of the market that allows the executions of your order is in your favor of your agreement then your order will be filled, if there are any fluctuations or changes in your order n the conditions you have agreed, then you will receive a notice that what are the changes in your order are seen then after you agree to it, the order will be placed again. When you fist entry a trade CEX.IO will calculate the price and will freeze it for 120 seconds. Then Bitcoins will be displayed when you input the amount of money you need to spend. SO then tap on Sell or Buy button and then system will check for enough funds to precede the action. Then the order will be filled on favorable conditions as per the market condition of your order. If the spike in exchange rate is seen then the execution of order will hold and will hive you notification. Only once this is confirmed the trade the order will be placed and balance is adjusted. As you know that there are four different accounts linked with the CEX.IO which are shown below with description. This account holder can buy unto %500 worth of Bitcoins per day and $2000 worth of Bitcoins on a monthly wise. This account is able to big $10,000 Worth of Bitcoins per day and over $100,000 With of Bitcoins in a month. This communication of account has no limitation of Buying or selling of Bitcoins from the shares. To become a verified account, the account holder must submit a government ID and Personal information to get the account verified. Use the CEX.IO Review 2017 and get updated about this application, secure your money by exchanging in a good way.